Disclaimer: I was given this novel by the author to review through the Literary Junkies Book Club. I was not compensated and all opinions are my own. Happy Monday everyone! I'm not going to lie, I wish I was still in bed and laying there for a while. Mornings are the worst, especially Monday after you've had such a great weekend and wish it could last longer. Anyway, on to another week with a really exciting weekend to follow. The Maroon 5 concert on Sunday is honestly going to get me through the week. Anyway, today I have for you a review of a book I recently read. It was interesting to say the least. It's calledRome for Beginners: The Semifictional Misadventures of Four Women and was written by Fiona Coughlin. I didn't really know what I was expecting when I started reading. It through be off balance at first because each chapter begins with text messages or emails or voice mails. I'd never experienced anything like this before so I was confused at first but really came to enjoy them. It says it's about four women but it's mainly about three friends whose lives have led them to living in the amazing city of Rome. They're each there for different reasons but their friendship brings them together. This is the best way I can describe this novel. It's a book version of a reality show. Here's what I mean. Reality shows are just random adventures of regular people (until they get famous). We watch them because we secretly enjoy them and like to vicariously live through other people. Rome for Beginnersis random adventures of four (mainly three) women living in Rome. I loved living vicariously through them. There isn't really a structure that I could pull out or a story line I could explain. It was a fun and easy read just about the lives of these average, American women living in a foreign city that they love and hate at the same time. It's full of history and culture and good times with friends. I enjoyed myself and it took me not a long time to read it at all. My one complaint is the ending. It came out of nowhere and I didn't understand why it ended the way it did. I wish that there would have been more transition to the end from the rest of the novel and some explanation as to why the author decided to write it the way she did. I'm not sure if I would read a zequel if it came out unless it had all the same characters again. Only, because of the way things ended, that wouldn't really be possible. Have I got you interested to see what happens now?? Good. Pick it up and enjoy yourself. The girls had read all about living in Italy. The way it worked in all those pink, glossy novels was: woman comes to Italian city. Woman buys farmhouse in Tuscany. Woman's toilet overflows. Woman has a good cry. Woman achieves self-realization. As Lilian was learning, living in Italy was no vacation. As a fifty-something academic living in Rome, she didn't feel any closer to self-realization, and she had bigger problems than plumbing. Her professor ex-husband had just started dating her boss (the Chair of the department), and if that weren't enough she's just found herself in an Italian Emergency Room, where the people around her seem "to be speaking some dialect of squirrel". Language problems won't hold her back, as she's got her friends Brennan (an athlete constantly risking deportation), and Suzanne (a newly divorced, single mother) to translate. This story follows these three unlikely friends in different stages of life over the course of a year: broken bones, dates in the Catacombs, multiple boyfriends named Massimo, spelunking into cavernous Roman ruins, killing one's own turkey in a country that doesn't celebrate Thanksgiving, explaining to a nun how adorable one's own child is after he is expelled, learning how to get some sleep when you've rented a room in a church directly under the church bells. As things get ever more messy these women will discover if they can get it all sorted, with or without all the "ciao bellas". 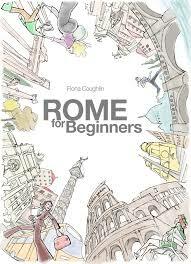 Rome for Beginners is skosh heavier than an average Chick Lit book, yet a smidgen lighter than normal Women's Fiction. Readers who love quirky reading or summer fare, who like satire, who like a biting sense of humor, and who are curious about Italian life should love this book. Lovers of Rome should also love the book, as the city is a character unto itself.